Nearly a century ago, Max Weber’s The Protestant Ethic and the Spirit of Capitalism articulated the animating spirit of the industrial age, the Protestant ethic. Now, Pekka Hinamen — together with Linus Torvalds and Manuel Castells — articulates how hackers* represent a new, opposing ethos for the information age. Underlying hackers’ technical creations — such as the Internet and the personal computer, which have become symbols of our time — are the hacker values that produced them and that challenge us all. These values promoted passionate and freely rhythmed work; the belief that individuals can create great things by joining forces in imaginative ways; and the need to maintain our existing ethical ideals, such as privacy and equality, in our new, increasingly technologized society. 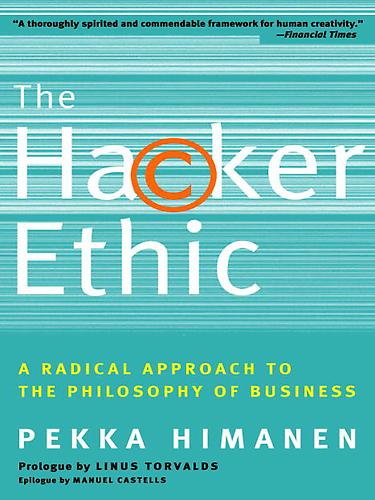 The Hacker Ethic takes us on a journey through fundamental questions about life in the information age — a trip of constant surprises, after which out time and our lives can be seen from unexpected perspectives. Awesome book! I read it about ten years ago, but I think it’s still mostly relevant. All employees *and* employers should read this. Good point! Most ‘tech’ books become more or less irrelevant as they age, but the reverse might be true here. I’ll have to re-read it sometime soon, so thanks for the PDF.